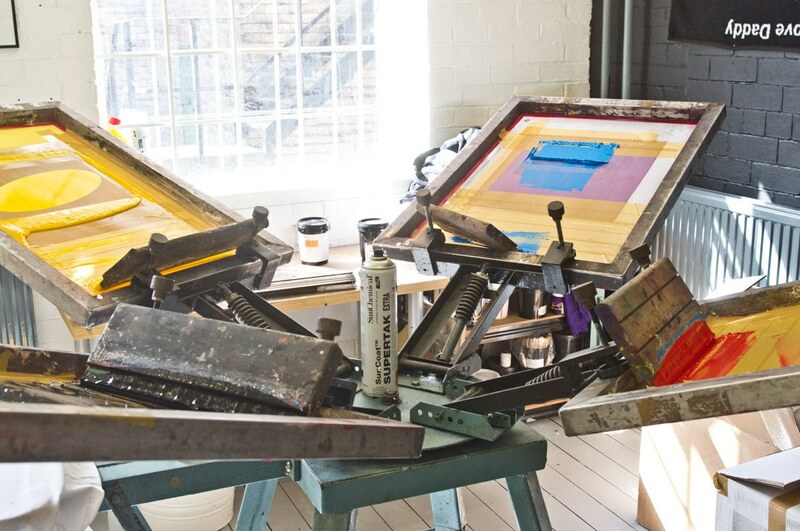 We're an independent T-Shirts printers, specialising in hand-pulled, water based screen printing. Find out more about what we do below. Printing T-Shirts is what we specialise in. 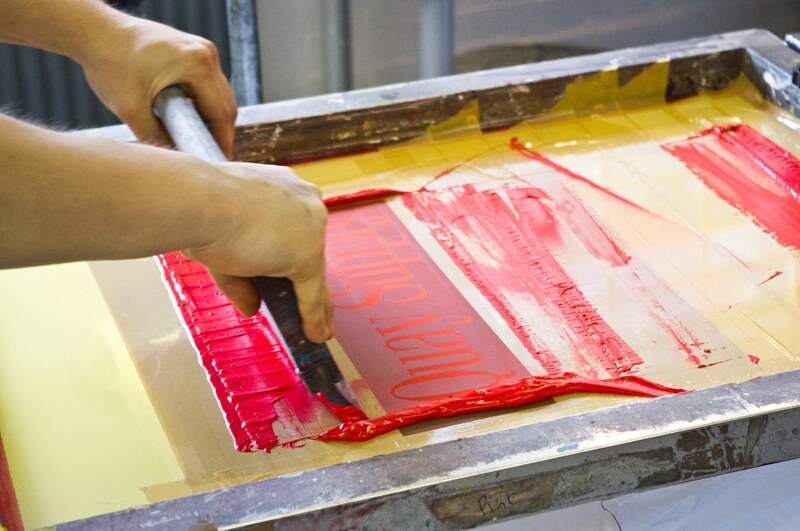 All our T-shirts are printed in house by hand with water-based inks. As well as T-shirts, we can also print onto a selection of other items including Tote Bags, Hoodes, Sweatshirts, Polo Shirts, Vests + much more. We can remove the labels from the necks of T-shirts and print your logo and sizing information. Keep your products safe and clean by having them folded and bagged in clear polybags. Not sure quite how to set up your artwork? Don't worry about it, speak to us and we can usually get your artwork print ready for you. The quickest way to get a quote for your job is to use the quote request form here. Alternatively you can email us at hello@thisisprintshop.co.uk. For most jobs we use environmentally friendly water based inks. These create soft prints that are light and comfortable, as opposed to the heavy and sticky prints you get with plastisol inks. Where possible on dark garments we use discharge inks so we can get a super soft print. How do discharge inks work? Discharge inks use a bleaching agent to remove dye from cotton garments when heat cured. For example on a black T-shirt, we can print a white discharge ink. On first print this will look like a dull grey print, however when the T-shirt is put through the tunnel dryer the discharge agent removes the black dye from the T-shirt and just leaves behind the white pigment. This results in a soft, breathable print on dark fabrics and also gives a print that will last as the dye has been permanently removed from the fabric. Discharge printing is only suitable for 100% cotton garments and can give different results on different colours/brands. We can advise on which shirts give the best results. What are included in your prices? All our prices include garments, printing, all set up fees and VAT. The only thing we charge separately is delivery as many of our customers prefer to collect their orders in person. Please contact us for delivery costs. Our minimum order is 20 garments per design. This is to cover the time and expense of setting up the screens for print. We can sometimes be flexible with this and drop to 10 garments per design is you're ordering multiple designs. Most ordered are completed in 8-10 working days. This may vary in overly quiet/busy times, however we will always advise if this is the case. In you have a deadline you need your order for, just let us know and we’ll do our best to meet it! Can I have a mixture of T-Shirt colours? As long as the colour of the print stays the same, you can print on any mixture of coloured shirts at no extra cost! Can I have a mixture of print colours? To change the colour of the print we have to remove and wash out the screen, then set it back up with the new colour of ink. We charge a £10 wash out fee for each ink colour change if you’re wanting to change the colour of the print mid run. Do you print inner neck labels? Whilst we don’t woven labels, we can print on the inner neck of your T-shirts. This could just have your logo, our could also include the size and washing instructions. For pricing and details on this please email us! What other garments do you print? As well as T-shirts, we can also print Tote Bags, Sweatshirts, Hoodies, Vests, Baseball Shirts and most other garments you can think of. We can also source a multitude of garments brands, anything from Gildan, Bella Canvas, Fruit of the Loom, all the way to Continental and American Apparel. If there’s a particular garment you’re looking for, just email us and we’ll let you know if we can source it.